The past performance of the Fund or the Index is not necessarily indicative of the future performance of the Fund or the Index. Performance of the Fund is calculated on market bid-to-bid basis. CIMB FTSE ASEAN 40 announced a dividend payout ex date 2nd April 2008. Figures in Total Returns column assumes dividend reinvested. Payout amount - USD 0.30. Yield - 3.15%. CIMB FTSE ASEAN 40 announced a second dividend payout ex date 30th April 2009. Figures in Total Returns column assumes dividend reinvested. Payout amount - USD 0.28. Yield - 5.12%. 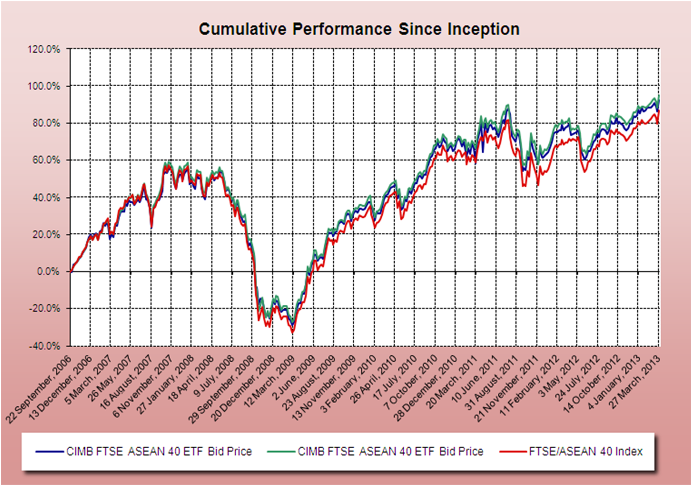 CIMB FTSE ASEAN 40 announced a third dividend payout ex date 1st April 2010. Figures in Total Returns column assumes dividend reinvested. Payout amount - USD 0.23. Yield – 2.68%. CIMB FTSE ASEAN 40 announced a fourth dividend payout ex date 11th April 2011. Figures in Total Returns column assumes dividend reinvested. Payout amount - USD 0.26. Yield - 2.45%.